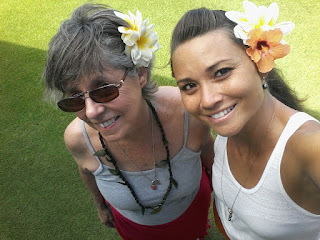 Almost a month ago, I had my first (but hopefully, not my last) hula lesson at the Royal Lahaina, Maui, Hawaii. My hula teacher, Sharise Dudoit #mauihulawahini, has been performing since the age of 12. She still looks that young to me, but she is mom to three, performing, teaching and giving the gift of happiness through hula. Here is the short video she captured on my phone after we had rehearsed the dance for about 20 minutes. Before that, she gave me by tea leaf lei, which I still have in my office, and showed me how to make my rosette out of plumeria blossoms. I learned more than how to dance the hula that day--I also learned how important Nature and its elements connect to the dance--and, most importantly, I made a new friend. Mahalo (thank you), Sharise.